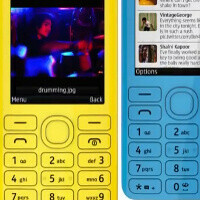 The Nokia 206 has just been announced, and it brings memories of past iconic Nokia devices like the 6300. What makes it different this time around is the extremely affordable price tag, and flashy colors. Available in a single and dual-SIM variants, the Nokia 206 costs just above $60 off contract. The device comes with the classic keypad of the past, and it sports a 2.4-inch QVGA display and expandable memory via microSD cards. There is also a 1.3-megapixel camera on the back, and 2G connectivity. As a bonus to that, you get 40 free games from EA, plus the new SLAM Bluetooth file-sharing technology. Battery life is outstanding at 47 days on standby for the single-SIM version, and down to 28 days on the dual SIM model. The Nokia 206 release date is set for Q4 2012 and it will first arrive in developing markets like India, Nigeria and Indonesia. Lovely phone! A very good choice as a secondary phone. A red 206 will go really well with the Yellow L920. Great phone i should say..Lumia inspired Asha phone...this should be nice to carry around. But i guess the camera could've been a bit better...atleast a 3.2 megapixel taking note that 6300 had 2 megapixel. I like the classic Nokia. love the Lumia nod. Will buy. but the interface irks me. it tries too hard to be a smartphone it's often complicated and unintuitive. I like the software of Samsung feature phones better. Its just a feature phone.. All asha phones are feature phones not smartphones... but thing is its a classic 206 n 205 reminds me x2-01 n 6210/5210 something name liked it. I can prove you wrong... Nokia S40 is much faster than your Samsung phone...and it's way smoother. i think nokia should've just start ground level of their os back... just an opinion because os in this phone for me is very nice. when they develop this os throughly, they could create a better environment between their smartphone and their classic phone just like apple..
yeah..beautiful indeed, like a lumia back....but nokia should take note that there's a china phone with same pricetag!